If you’re pressed for space this is a great little make that’ll give you plenty of added storage space and a stage to display special finds. Wine merchants are happy to part with these wooden crates for free or for a charitable donation. 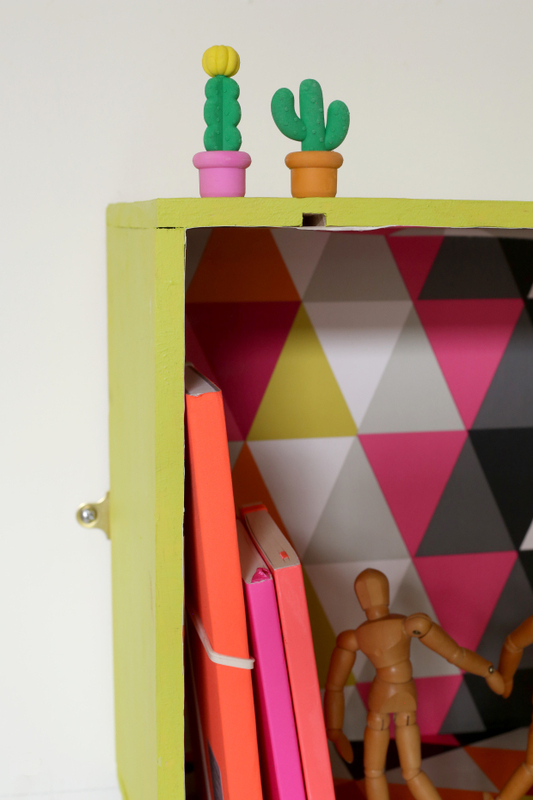 It only takes a lick of paint and bold geometric wallpaper to transform a discarded crate into a must have box shelf. I chose wallpaper from Harlequin, a roll will go a long way, there’s plenty left for covering lots of things like files, books and shelves. 1.Paint the exterior of the box with emulsion paint. 2. Mix pva with a little water to the consistency of double cream and paint the inside of the box to seal. Leave to dry. 3.When dry measure and cut wall paper to size. 5. When dry, using the drill screw picture frame brackets to the reverse on the edge, drill holes in wall then screw completed box to the wall.